It’s not vacation time anymore, it’s time for some knitting! My knitting time has seriously been reduced these past months, it seems that most of my free time I’m sewing box bags lately. Thankfully, Stitches East is next week and after that I’ll be done with this particular rush. I have been knitting for Stitches East as well, so what you see today are items that I hope to have done by next Thursday! I only needed one sock for Stitches so I’m all set with that. I will be bringing sock #2 along in case there’s some downtime. This one is 99% done, I really just need to weave in the 6 ends, and then I’ll be done. Maybe I’ll be able to get some good FO shots this weekend! 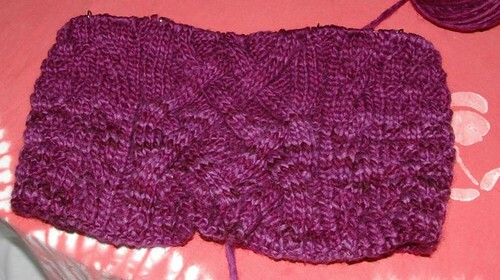 This is Carol’s Kensington Cowl. 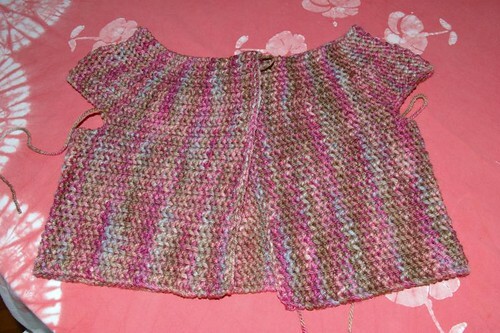 I am about 2/3 done and I hope to get another few rows done tonight. I definitely should have this done in time for Stitches. It wasn’t until I took this photo that I noticed the difference in the 2 skeins I’ve used so far. I’m hoping that since I hadn’t noticed until then I won’t notice it anymore. If you’re in New England, I really hope to see you there! 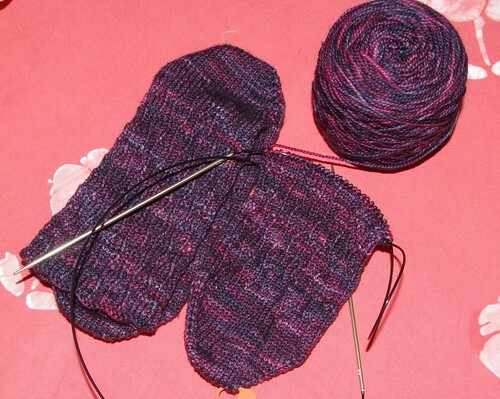 I love, love, love the yarn in your Tesserae socks! The cowl is looking great! I like to wear mine folded so the color difference will be barely noticeable!